These are by far the best speakers I have ever owned and/or listened to...and spent time on. I previously owned about 7 (seven) different specimen in a period of over three years, meanwhile sold most of them and kept two with the highest WAF (Wife Acceptance Factor). The ones with black fronts (golden being "prohibited" by better half ;-)); and a nice set of oak spiderlegs (both constructed & attached). All in all a complete overhaul has been performed during a period of about three years, ending in 2019. All cabling has been upgraded to silicon high power lines. The two EHT units replaced with completely new ones, all transformer components have been changed, conformal coating (re-)applied to the stators; all rivets have been drilled out and removed, the flimsy plastic loudspeaker posts are now golden connects. One of the prejudices is that 57s produce insufficient bass. I beg to differ - consider trying a freshly refurbished pair. In summary: be aware (! ): these speakers can become highly addictive and are time consuming - most of all in combination with a Quad 303 or 405-2. In retrospect: must have spent literally 100's of hours studying, refurbishing and listening to "Walkers' Little Wonders" with a big grin on my face. Standard plastic loudspeaker connects too flimsy; fronts easily dented; rather low WAF; units super (!) directional (complicated to find sweet spot); some spare parts are costly (stators; panels; EHT unit; transformer); increasingly hard to obtain a set in a reasonable price range; older 57's suffer from insufficient bass signal; rather bulky size hence hard to transport; potentially highly (!) addictive when functioning correctly. I have owned a pair of these speakers since 1976 and they are still going strong. I have never had anything done to them. The front covers are rather easy to dent, unfortunately. I have a dent in both of mine. One happened when we moved house (I think) and the other when a knock at the door startled me and I dropped the vacuum cleaner hose, which struck the speaker. As far as I'm concerned my Quad equipment doesn't need replacing, though it would be nice to be able to listen to downloaded High Res music through it. I accept that this is never going to happen. I don't have $50,000 to $100,000 for new equipment. None as far as I'm concerned. I suspect many people whose speakers no longer work have been abusing them. There was good reason why these speakers were often preferred by organists. Nothing can produce as much bass sound as an organ! None as far as I'm concerned. I suspect many people whose speakers no longer work have been abusing them. I will not repeat what so many have already said except to comment on the narrow listening. While I agree that these speakers are more sensitive to positioning and the room it is not untrue for other speakers as well. The bottom line is the listening experience no matter where you are is excellent. I have mine in my main living area and the TV has been moved out. No matter where I am in the room ( kitchen and living area together, wider townhouse so 2.5 longer than wider. ) I can hear all the good things that have been said about these speakers. Having said that listening alone in the sweet spot is extra special. About 15 years ago i used to have a set of these ESL57. They were not in good shape but still quite impressive. They started to tick when you would play a little louder. I sold them and bought several other sets of speakers. About seven years ago I found a dutch company ESL Labs (I'm dutch myself) that was specialized in refurbishing and restoring ESL57's. So i decided to find a set (not necessarily a very good set) to have them completely rebuilt at this company. New transformers, new foils, new connectors for the wires to the power amp and a overload protector. Buying the set and rebuilding them costed me about € 1600 in total and there is absolutely no other set in this budget range (new or used) that can compete with the ESL57. The sound is so amazingly neutral. If you found a good position for your ESL's (they need space) and you found your sweet spot (it's true what everybody says: it's a small spot) they seem to disappear: you only hear the instruments in their original position, original size and with their original sound. You hear things you never heard before in the music you know so well. The backside of this medal: so many CD's have bad recording quality and that is also revealed by listening through these ESL's. I have a Quad 303 power amplifier (there are so many power amplifiers that cannot drive these ESL's, but this one is great). All the parts of this unit has been replaced by new parts. Especially for the big elco's I advice to do this with every amp that is older than about 10-15 years. The quality of these parts fade away and you'll hear the difference. My friend has a set of these Quads. Since we're both audio buffs, we'd sit and listen several times. The pro is the sound and imaging are stellar -- once you got everything dialed in. Unfortunately, there are several cons. First, the "sweet spot" is very fine, almost for a single person. It took a while to arraign the speakers so they listened well. Being on the floor with a slight upward pitch, the focal point for the listener ascends. The floor footprint is rather large, so these are not for a small room and the listening area must be dedicated to just that. My pair of 57s is middle-aged (late70s) and still sounds breathtaking. Let me amend that: the music sounds breathtaking. This iconic 50+ year-old design has simply no sound of its own, none that I can hear at least. A sublime design - were I a speaker builder I would either give up or do my best to copy this - that closes the book firmly on nonsense like exotic cables, expensive power cords and the like. Like Sri, I use a bog-standard set of interconnects, having got rid of all my expensive designer gear. Result; bliss. I've attempted to augment the bass with a variety of subwoofers, some being rather expensive; nothing, repeat nothing was an improvement on the original. I would say the same for supertweeters. This is the end of the line. Unless they get eaten by giant moths (unlikely) I am devoting my time to music from here on. No other speaker has what the 57 does: a midrange to die for. The extremes of frequency are utterly unimportant by comparison. The treble, like the power of a Rolls Royce engine is "sufficient". So is the bass. Why you would want more is beyond me. For those recordings that require a lift or a tilt down I have tone controls, but I use these exceedingly rarely. My only criticism of any importance is against myself: I try not to think of the money and time that I have spent/wasted in the last 25 years! Peter Walker got it right first time, and the fact that there is a small army of listeners who will never be parted from their 57s is a wonderful testament to that. I am one of them. Just bought a late serial numbered version of these immortal classics. Mine are in the 45000 range, which makes them near the end of the run. I consider this the best audio purchase I have made in the last 25 years. Simply put, there is NOTHING that come close to the sound of the original Quads. I have owned the later Quads, including the 63s and the 989s. They sound veiled and bright in comparison. In the fairly narrow sweet spot, these have a mesmerizing sound. Strings sound meltingly pure. Voices sound spookingly real. The sound of these speakers is like listening through an open window to an instrument or voice just outside. They have sufficient bass to satisfy almost anyone, save those who treat their stereo as a toy wanting to hear subway trains or subsonic nonsense. Even in my very large room, they play loud enough for me. The main weakness is that they are a very narrow dispersion design. The stereo image is really only satisfying for one person. Don't waste another nickel of your hard earned money on nonsense like cables to fix badly designed products. I am using these with zipcord. The sound is better than anything I have ever heard in the last 25 years! I can now die in peace! I paid 1600 for these. I would not sell them for 10 times that price! Absolutely amazing midrange transparency and realism...completely convincing soundstage, both in depth and precision.....from 50 Hz up these speakers are scary good...the best I have personally ever heard! Won't produce prodigious amounts of bass or very much extension below 50 Hz. I purchased a used pair of 57's in the early 90's for about $800. I have heard a lot of other speakers that can do certain things better than Quads's (bass, sheer volume levels, etc. ), but none that can create the sense of realism and transparency that the ESL-57 presents. I've listened to B&W 801's and 808"s, Thiel's, Vandersteen's, Snell's, Merlin's, even ESL-63's and Martin Logan's, and none of them has been capable of resolving music to the extent that the 57's do! Thay are, simply put, the most transparent natural sounding loudspeaker I have ever heard...period! I must confess that there are many speakers that I have not yet listened to, but have heard great things about; like Sound Lab's and the larger Magnepan's. But as of this writing, I have yet to hear a speaker that is capable of relaying voice and instrumentation with the startling sense of realism that the 57's do. None that matter to me. 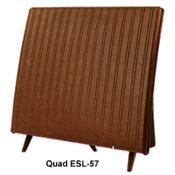 Back about 1970 I first heard a pair of Quad ESL57s and I remember being unimpressed. They just sounded so ordinary. Many years later I bought the pair I have now and I realized that the fact that they sound ordinary is their greatest strength. They just sound like the real thing. OK, so they are not going to blow the roof off and organ pedal notes need a bit of help from my home made sub-woofer but everything else is just right. I can listen to them for hours and they are do not induce listening fatigue. For voice and accoustic instruments they are just so accurate. And the stereo image is so stable and deep. These things may have limitations but I am more than willing to live with them for the amazing ride they give on just about everything. For a product designed in the 1950s and made in 1970 the support is fantastic. Nothing else I have ever had has even come close.